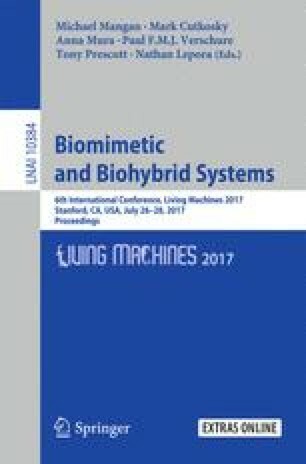 This paper presents the design and development of a novel biologically inspired knee design for humanoid robots. The robotic joint presented mimics the design of the human knee joint by copying the condylar surfaces of the femur and tibia. The joint significantly reduces the complexity, while preserving the mechanisms of the human knee’s motion, and the torque requirements. This joint offers the remarkable feature of being multifunctional since it separates structural and kinematic functions namely integration of (i) high level of shock absorption due to its dynamic variation of pressure between the articular surfaces and its curved profile and (ii) high mechanical advantage due to its moving center of rotation. These functions are essential for humanoid robotic limbs where performance improvement is requisite. The design demonstrates the possibility to simplify the knee linkage arrangement while still providing a moving center of rotation by dynamically changing the pressure between the joint surfaces (femur and tibia). This dynamically controlled pressure enables accurate joint movement by mimicking the human knee property of the same feature. A prototype of the joint has been developed for testing the beneficial properties designed into the model. The authors acknowledge the support of the Mechanical and Materials Engineering Department in the Maseeh College of Engineering at Portland State University and the support of the UK Engineering and Physical Sciences Research Council (EPSRC) under grant reference EP/P022588/1.